Veeam Backup & Replication will add new incremental restore points to the backup chain and keeps existing restore points until a new active full backup is created. 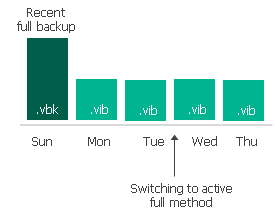 Veeam Backup & Replication will add a new active full backup to the backup chain. Veeam Backup & Replication will keep adding new incremental restore points to the backup chain. When the number of restore points in the new backup chain is equal to the number allowed by retention, Veeam Backup & Replication will remove incremental restore points that precede the new active full backup. After this, Veeam Backup & Replication will use the new method to create the backup chain in a regular manner. In this case, Veeam Backup & Replication will work by the standard archive full backup scheme. For more information, see Weekly Backup Cycle. During the first backup copy interval after the switch, Veeam Backup & Replication will add a new incremental restore point to the recent backup chain. Veeam Backup & Replication will keep adding new incremental restore points to the recent backup chain. When the number of restore points in the recent backup chain is equal to the number allowed by retention, Veeam Backup & Replication will build a recent full backup out of the latest archive full and the first incremental restore point in the new backup chain. After that, Veeam Backup & Replication will remove all incremental restore points from preceding backup chains. If there are any outdated archive full backups, Veeam Backup & Replication will remove them, too. 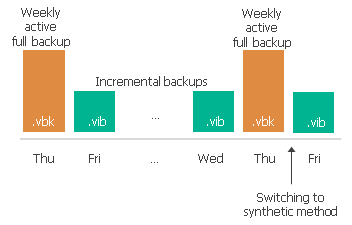 Subsequent backup copy intervals work according to the standard retention scheme for the synthetic full method of archive backups. 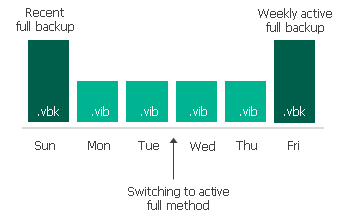 For more information, see Weekly Backup Cycle.